Experts agree that the most severe impacts of climate change can be avoided if the global rise in temperature remains below 2oC, but meeting this goal will require more aggressive and large-scale action than the current policies and promises of the Paris Agreement (UN 2015; Kossoy et al. 2015b). The idea of using a global emissions trading scheme (ETS) to help meet global reduction targets was popularized by the Kyoto Protocol (KP) in 2005 (Roppongi et al. 2016; UN 1998). 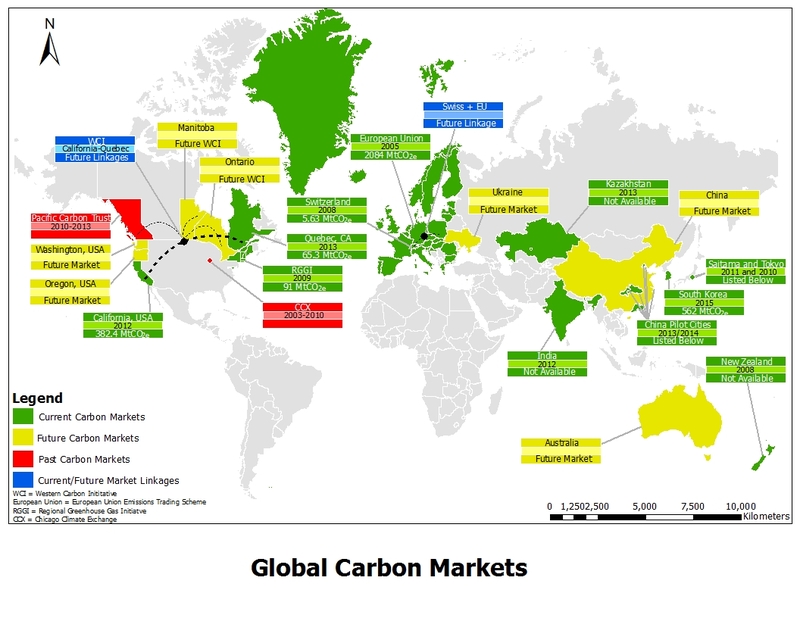 Since then, the share of emissions covered by carbon pricing has tripled and, by August 2015, about 39 national jurisdictions and 23 cities, states and regions had implemented a price on carbon, covering about 7 GtCO2e (12% of global emissions) (Kossoy et al. 2015b). An international ETS has continued to be an important point of discussion in climate policy and is acknowledged in the Paris Agreement as a necessary tool for addressing climate change (Johannsdottir et al. 2016). A carbon market refers to any market created through the trading of carbon (or carbon equivalent) allowances, which allow the holder of an allowance to emit the equivalent tonnes of CO2e. The rationale behind this system is to enable emissions reductions to take place where the cost of reduction is lowest, thereby minimizing the overall cost of addressing climate change (DECC 2015). The most mainstream ETS design is cap-and-trade, which involves setting an absolute cap on emissions above a baseline emission level and either trading additional emissions or purchasing extra if needed (Kill et al. 2010; Roppongi et al. 2016). 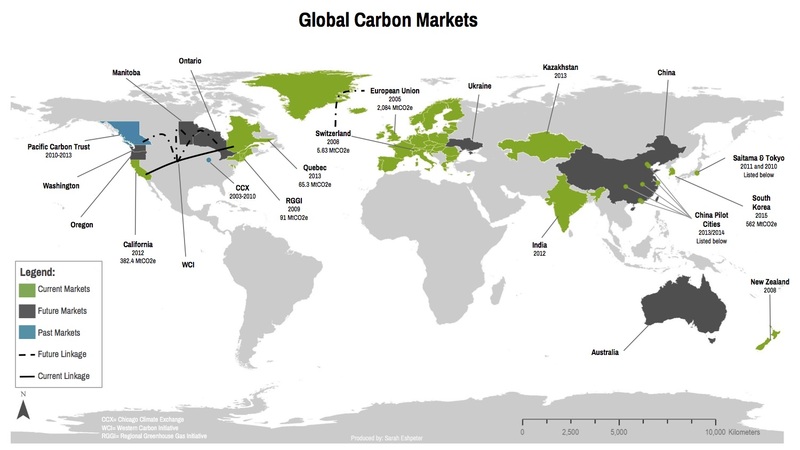 Carbon markets have been introduced all over the world at many different levels of enforcement (sub-national, regional, national, and supranational) (Ranson & Stavins 2016), with 40 countries currently operating 18 carbon market systems, all of which exemplify varying characteristics, strategies, linking potential, and levels of success. This paper compares these currently operating carbon markets to determine the benefits and limitations of varying strategies. It reviews all 18 markets, including their design, rules and regulations, to provide recommendations for development of an effective, environmentally and economically responsible ETS with linkage potential for eventual creation of an inclusive global carbon market system.